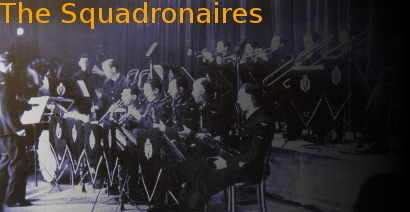 The Squadronaires CDs @ Hep Records, jazz in depth from the 1930's to the present day. In the meantime, you may like to peruse the Wikipedia page for The Squadronaires. 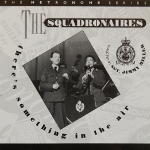 "There's Something In The Air"
Historic Collection of wartime performances by The Squadronaires RAF Dance Band with George Chisholm, Tommy McQuater and Jimmy Miller from 1943-5. Titles - Prelude In 'C' Minor / The Nango / The Waiter, The Porter & The Upstairs Maid / Tuxedo Junction / Mexican Hat Dance / South Rampart Street Parade / Jumpin' Jiminy / High Society / OK For Baby / As Long As There's Music / Darktown Strutter's Ball / Cherokee / Runnin' Wild / There's Something In The Air / Hey Ba-Ba Re-Bop / Pompton Turnpike / Trees / Jealous / Lead With Your Left / Flying Home / I'm Getting Sentimental Over You / I'm A Ding Dong Daddy From Dumas / A Little On The Lonely Side / Piccolo Pete / I'll Be Seeing You / I Ain't Got Nobody. The Squadronaires - "Prelude In 'C' Minor"